In an effort to collect my work here, I am reposting some dolls from from my previous sites. 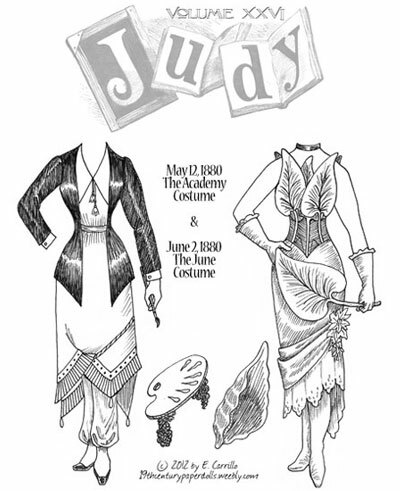 I want all my Judys in one place, so this is the first from that series. I’ll post the second one next week (probably on Tuesday), and I have an all-new series coming that should be ready around Thanksgiving. And don’t worry: I’ll still post an all-new doll tomorrow, as per the schedule. 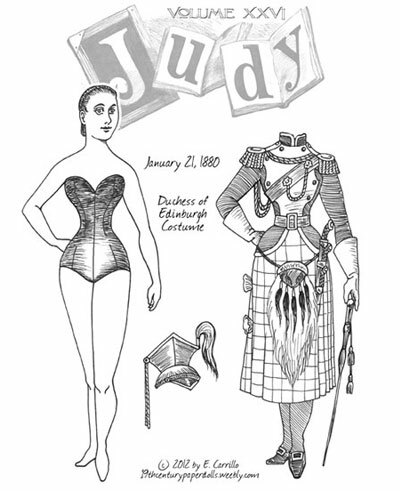 About Judy: Judy; or the London Serio-comic Journal was a weekly periodical published from 1867 to 1907 as a competitor to the much more popular Punch. One of its regular artists was A. Chasemore (possibly a pseudonym), who drew the “Fashion for the week”. These illustrations were fantasy concoctions; nothing anyone would have worn except in a theatrical or masquerade ball. 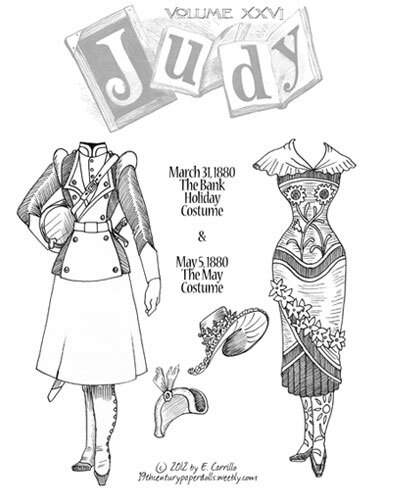 The costumes were allegorical, sometimes political, and mostly whimsical. And since they were published in black & white, the sky’s the limit on as far as color interpretations! 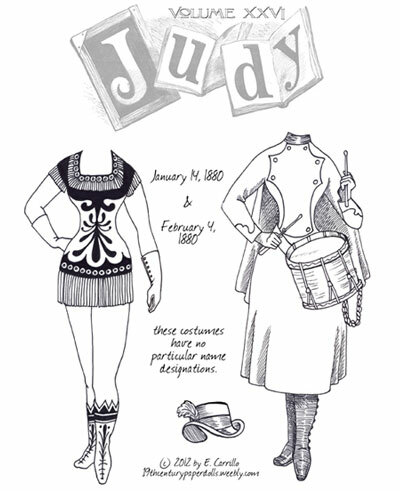 The model for the outfits was a nameless and idealized “everywoman” but I have taken the liberty of calling her Judy after the publication. 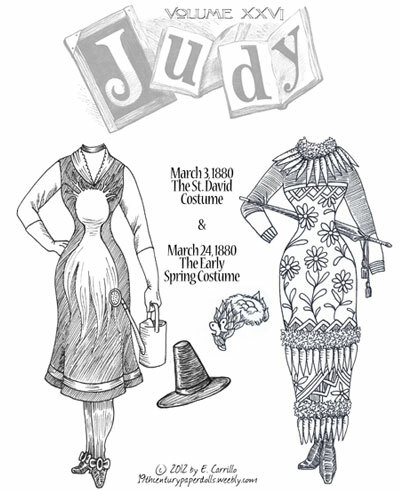 There actually was a character named Judy associated in the paper, but she was a comical, unglamorous frau. 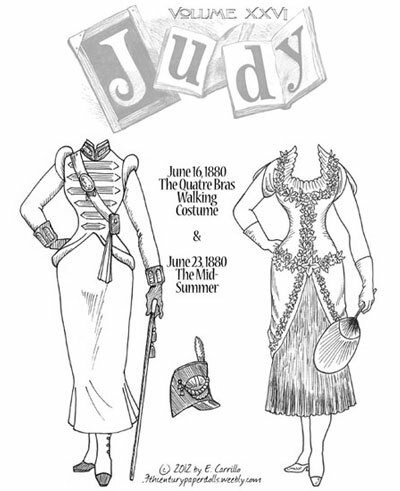 These costumes are from Volume 26 of the series, published in 1880.